Artists are heavily involved in the activities to commemorate the 350th anniversary of the Great Fire of London which started on 2nd September 1666. 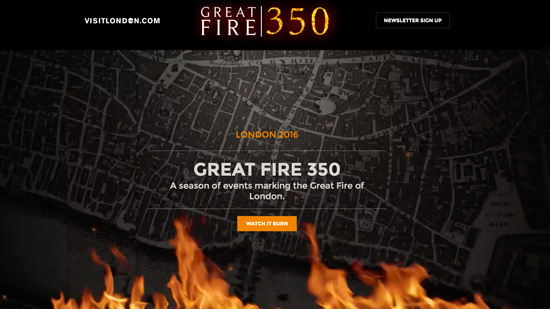 This weekend is all about Great Fire 350 in the City of London. The Great Fire of London started in a baker's shop belonging to Thomas Farynor. By 1am his house in Pudding lane was ablaze. The fire then spread quickly down Pudding Lane and carried on down Fish Hill and towards the Thames. Buildings were made of timber and their roofs were covered in pitch to make them waterproof, However these made them very combustible and it was easy for the fire to spread as buildings were typically built very close together. The fire soon took hold: 300 houses quickly collapsed and the strong east wind spread the flames further, jumping from house to house. The fire swept through the warren of streets lined with houses, the upper stories of which almost touched across the narrow winding lanes. Efforts to bring the fire under control by using buckets quickly failed. Panic began to spread through the city. As the fire raged on, people tried to leave the city and poured down to the River Thames in an attempt to escape by boat. The London's Burning Festival, organised by Artichoke, will involve a range of activities across the square mile of the City of London. London’s Burning will bring the Square Mile and beyond to life with a series of art installations, performances and talks that will give a contemporary perspective on a significant moment in the country’s history. This is the official website for the commemoration and the Festival. You can also Download the programme of events taking place between now and the finale - the big burn - Sunday. Artist Martin Firrell presents Fires of London, two new commissions either side of the River Thames. Fires Modern will project Firrell’s text and flames about stories of resurgence and change that have shaped the UK’s capital city onto the flytower of the National Theatre’s (NT’s) iconic Grade II listed building. French fire alchemists Compagnie Carabosse will create a Fire Garden on the riverside area in front of Tate Modern - transforming it into a crackling, spitting, after ­dark adventure. On Sunday 4 September, the finale event will be the burning of a structure depicting medieval London, on the River Thames between Blackfriars and Waterloo bridges. The structure is an artistic interpretation of the look of the city in 1666 and it's being assembled on barges - ready for burning at 6pm on the evening of Sunday 4th September - view the video below to find out more. Artichoke has been commissioned by The Space to produce a live digital broadcast of the spectacular finale event, London 1666. An extraordinary 120­ metre long sculpture of the 17th ­century London skyline will appear on the River Thames and burn, in a dramatic retelling of the story of the Great Fire of London of September 1666. A collaboration between American ‘burn’ artist David Best and Artichoke, the project has involved months of work and participation with local schools and young Londoners. You will be able to watch the burn online live! Also this is a map showing the planned line closures for this weekend and also bus replacement information, please click here. although the Central Line is running normally.